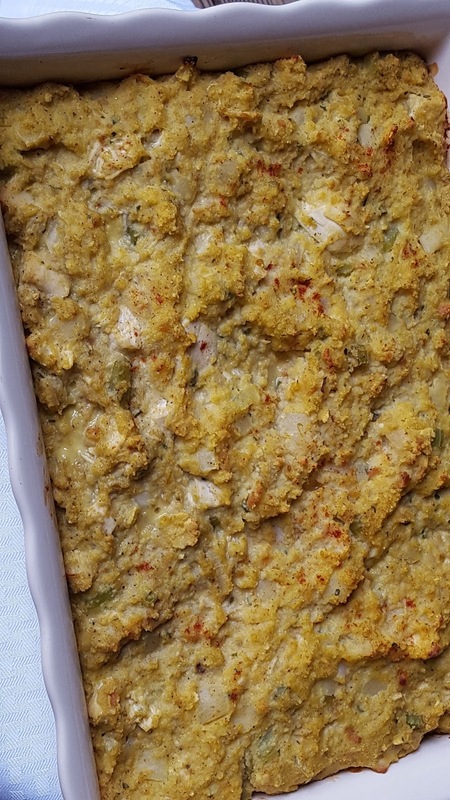 Chicken and Dressing Casserole is a wonderful meal. It takes a little bit of time to put together but is well worth the effort. You can save a little time by preparing the cornbread the day before. This recipe will easily feed 6-8 people, depending on appetite. Leftovers are great too! I serve the casserole as the entire meal but you can add a couple of side dishes if desired. For cornbread: Preheat oven to 400℉. Combine cornmeal, flour and baking powder in a mixing bowl. Add buttermilk and eggs, stir to combine. Pour melted butter into a round baking pan or cast iron skillet and add cornbread batter. Bake 20-25 minutes. Add chicken breast to a stock pot and cover with water. Bring to a simmer and continue to cook for 15 minutes. Remove cooked chicken and set aside until cool enough to handle. Cut into cubes once cool. Add a half stick of butter to a small skillet and melt over medium heat. Add diced celery and onion and saute until translucent, 6-7 minutes. In a large mixing bowl add cubed cornbread and package of Stove Top. Pour sauteed vegetables and melted butter over bread mixture. Give a quick stir to combine. Add cubed chicken, chicken stock, cream of chicken soup and seasonings and stir to combine. Finally, add the beaten eggs and stir to combine with the rest of the ingredients. Pour mixture into a large casserole dish. I'm glad you found us too! Thank you for stopping by. This dressing recipe is one of the versions that are traditionally used. Honestly, I have never tried it with any other type of cornbread recipes. I use to work in a deli and we served something similar to this in the hot foods section. On of the differences was we added "ends" of cheese like Swiss,provolone, Munster or smoked Gouda – makes it so flavorful and creamy! I now make it for my family. I will have to try it with the cornbread that sounds so good! Thanks for stopping by! I hope you'll get to try it soon. I hope you enjoy it Andrea! Thanks for this recipe.I knew it could be done but I'm not the cook my wonderful mother was. Her dressing was the very best and I loved the sage flavor but I was not sure of the amount. Thank you for stopping by Jan! I hope you get to enjoy this dish soon. This looks amazing! Which brad of cornmeal do you use? I know that makes a difference when you make anything with Cornbread. Do you used the entire pan of cornbread of just a portion? Thanks! The recipe looks delish! Looks amazing! Definitely gonna make this. Thank you! Thank you Susie! I hope you enjoy it. Thank you for this recipe! Cooked it yesterday and will no longer get it from a restaurant!!! A wonderful taste & simple to make! I am so happy that you enjoyed the recipe. It’s one of my family’s favorite meals.